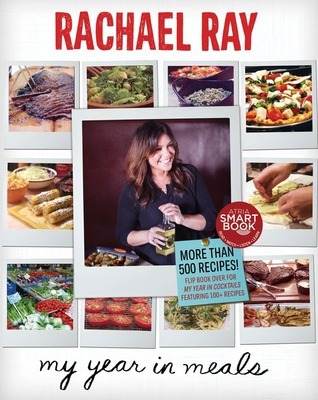 Rachael Ray's latest cookbook effort is a two-fer. She teamed up with her husband to make My Year in Meals and My Year in Cocktails. Both Ray and Cusimano chronicled all the meals and cocktails they made for an entire year and photographed the dishes with their own cameras without the help of a professional photographer and food stylist. Given that Ray has published so many cookbooks, I have to tip my hat to her for trying something new and different, but I'm not entirely sure this effort was a success, in my opinion anyway. When I look through a cookbook, I want the pages to be sleek and minimalist so as to let the food speak for itself. I found the pages of this cookbook to be much too busy and difficult to follow, with many different photos, dates, recipes, and fonts on each page. I didn't feel inspired to cook when thumbing through the pages of this book; I felt overwhelmed. If there is a redeeming quality to this book, however, it's actually the My Year in Cocktails section. The pages in this section of the book have much less "stuff" and so the drinks can speak for themselves. And I have to say, I am quite impressed with the breadth of Cusimano's talent for mixology. All of the drinks in this section were creative and the pictures made me more thirsty for John's drinks than hungry for Rachael's food. If this book has a saving grace, I think that it was the fact that Rachael teamed up with her husband. I suppose it would take more words to describe a meal than a single drink, and maybe Rachael Ray's more wordy than her husband anyway? She should have focused on one dish at a time instead of chronicling every meal, it sounds like. Well at least the cocktail section is good! I have been curious about this book. I had a look inside on amazon and don't like the structure of it either. It seems it's hard to find something as the meals are sorted chronologically and not by theme. A bit odd, but maybe entertaining - and at least, real life, :). I have never picked up one of her cookbooks-no real reason-I think that I stay away from the celb chefs. Thanks for your candid remarks. I've been curious about this one too. As you said, it's a good idea and kudos to her for trying something different, but if it's hard to follow . . .
Well, the idea is a good one, but all the "stuff" probably would have been a distraction for me, too. At least it worked for the cocktail section. Thanks for sharing your review. I am always disappointed when I buy a new cookbook and I am not inspired to make any of the recipes. Maybe after experimenting with a few cocktails the books would look better! Too bad, at first I was excited to see the book... but too much in it would not be good. I can only imagine what his liver is like if he had a different cocktail every day! Hope you have a great week. Probably not something I would buy but I would check it out at the library. I heard her talking about this book on her show last week. I try not to buy cookbooks since I can usually find anything I want online. I'll have to flip through this the next time I'm in a bookstore. How have I not heard of this book before now? I'm going to go check it out. Sorry you didn't care for the food section much! I think that I would like the cocktail section better as well. I leave the mixology up to hubby, but i do let him know when it's cocktail time and what type I might be liking. Cool concept -- but I think I'd rather read it as a blog or a twitter feed than a book. Her tv shows are too wordy for me..but the cocktail part sounds I the resting. This one would not have tempted me anyway, but it does sound a bit cluttered.